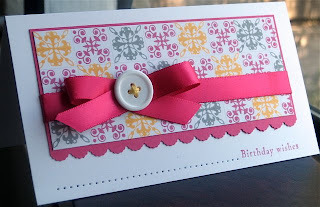 Gorgeous ribbon and color combo! Beautiful card. Ready for Spring look. I can't stop looking at this, it is gorgeous! Why have I not gotten this stamp set yet? I love it every time I see it. TFS! Wow, Harriet, this is just wonderful....I look at this set longingly! So many stamps, so little time!